ANANTAPUR: A 30-year-old woman devotee of Sathya Sai Baba was found dead under mysterious circumstances in a classroom of Sai Vidya Vahini, a school run by the Sathya Sai Central Trust, at Puttaparthi in Andhra Pradesh this afternoon. The woman, identified as Sai Prava of Delhi, used to be a coordinator at Sai Vidya Vahini but had resigned from her post recently. She was found hanging from the ceiling of a classroom at around 12 noon by workers. As it is the summer vacation, there were no students in the school. Members of the Sai Baba ashram’s Seva Dal informed the police. Though it is being described as a case of suicide for reasons yet unknown, the Puttaparthi police, who have registered a case, are investigating other possibilities. The International SSO A major participant observational sociological analysis of its goals, structure, management and functions. The Sathya Sai Cental Trust was and is the overall decision-making body over all money and projects. Sathya Sai Trust accounting ‘leela’? Sathya Sai Central Trust era of unaccountability drawing to a close? 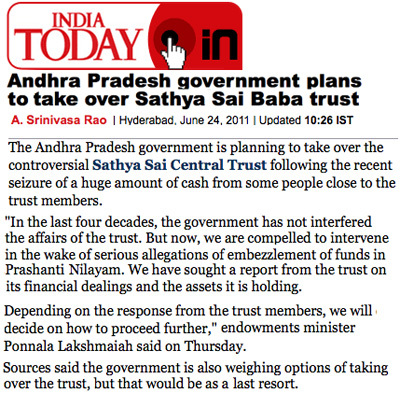 Sai Central Trust van impounded by Andhra police with treasure trove? Sathya Sai Central Trust untrustworthy! “The bitter turf war within the family of the late godman Satya Sai Baba turned nasty and spilled onto the streets. In an ugly show of strength, supporters of Baba’s brother’s son and Sathya Sai Central Trust member Ratnakar took out a rally in Puttaparthi today. They burned the effigy of Ganapati Raju – the nephew of Baba – to protest against the latter’s recent allegations against Ratnakar. However, the protest soon turned nasty with Ratnakar’s followers making a vain attempt to storm the house of Ganapati Raju. Timely intervention… and the police avoided what could have been a full blown faction fight in the name of spirituality. The trouble broke out after Ganapati Raju made a scathing attack recently on Ratnakar. He alleged then that Ratnakar siphoned off money and plundered diamond and gold jewelry worth thousands of crores of rupees from the Trust. He’s dashed off a letter to this effect to the Chief Minister, Governor, DGP, and CID officials. Those who know how things have developed at Prashanthi Nilayam since Sai Baba’s ignominious decease and discoveries of his miserly hoarding of massive wealth are in no doubt whatever of the corrupt nature of the Sai Central Trust, which has always been totally unaccountable to the public, even despite widespread press revelations of embezzlement there during their investigations after the in famous murders were committed in Sai Baba’s rooms in June 1993. This latest outbreak of violence is just another example of the real underlying nature of those involved in this cult, whose leader Sai Baba approved the killing of four devotees by the police. His nephew, R.J. Ratnakar – son of Janaki Ramiah who was the main organiser of the police murders of devotees in 1993 – has long been known to be corrupt, especially by those family members he has reportedly threatened to murder. One now sees how he uses his money power and consequent control of all those at Sai institutions and all who are dependent on the Trust for their livelihood – to enforce them to take part in a totally unspiritual uproars, thereby also approving violent behaviour to gain his ends. 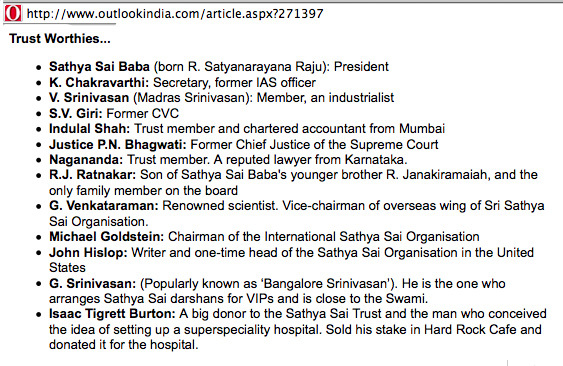 The same report does not even include V. Srinivasan, who is perhaps the most central Trustee at present. As with almost everything concerning the Sai Trust, there is no exact information available as to what distinguishes a trust ‘member’ from a Trustee, or a director or board member, if anything. R.J.Ratnakar: Satya Sai’s nephew. Ratnakar was included in the Trust after the death of his father Janakiram. K Chakravarthi: former IAS officer (disgraced) and a district collector. He has now resigned as secretary of the Shri Sathya Sai Central Trust. S V Giri: He resigned as Central Vigilance Commissioner during 1998. The Vice Chancellor of the Sri Sathya Sai University. Justice P N Bhagavati: former Chief Justice of India (for one year). Indulal Shah: Chartered Accountant from Mumbai, former government minister. S.S. Naganand: Supreme Court Lawyer. T.K.K. Bhagavat: former Indian Overseas Bank Chairman. Former Sathya Sai Central Trust members of ill-repute Other reports which have figured prominently include even US citizens Dr. John Hislop (who died of brain cancer in 1996 despite Sai Baba’s prediction that he would outlive his wife, which he did not), Dr. Michael Goldstein – successive International Chairmen of the Sai Organization and Isaac Burton Tigrett (the original Hard Rock Café owner and donor of the Super-speciality Hospital in Puttparthi). However, no foreigner has ever been allowed to join the Central Trust, which was the true inner coterie, which also conducted the main rumour-propaganda, cover-up and undercover work to protect Sathya Sai Baba from prosecution. The most important question that has not yet attracted enough attention is the question of who rightly owns this money. The Central Trust’s default answer to this question is that this is to be regarded as donations to Sathya Sai Baba for his Trust. However, under the Charter of the Trust, Sathya Sai Baba was not entitled to receive cash or any other tangible assets as donations. All the money and valuables, which come as donations to the fund were to be deposited by cheque in a bank. However, by making these goods the property of the Central Trust, the fund condones Sai Baba’s illegal receivership and violates its own Charter. These large scale financial irregularities are quite sufficient reason for full or partial control of the Trust by the government, or even for the criminal investigation of financial fraud. The huge tax rate of more than 30% of the total value of the recovered valuable that the Fund has hastily paid to the Treasury of Andhra Pradesh is highly suspicious. If this money belonged to the person of Sathya Sai Baba, as is obvious from the way it was stored and guarded by him so carefully, then it must be admitted that there is misappropriation of property by the Trust. In this case, relatives, but not the Trust, are probably entitled to these goods as inheritance. However, if we consider that this money was in fact intended as donations to charity, then the relatives of Sathya Sai Baba could not benefit by making it their personal property. In any case, the question of ownership entails the question of the origin of these goods. It is known that Sathya Sai Baba has repeatedly claimed that he did not accept gifts or personal donations. How, then,could he have accumulated so much privately in his room, where items were even hidden within his king-sized bed? Does this mean that he did not trust the other members of the Fund and thus tried at least partially to control the wealth? Or was the Trust aware of the illegal accumulation of wealth? How long has the hoarding gone on? Who are these people that made the sacrifice of wealth and did they know the fate of their donations? These issues will continue as a permanent and indelible stain on those involved. Even if we never receive the full answers to them, it is obvious that the wealth is of unknown origin and assigning it to the CentralTrust Sathya Sai Baba by the Central Trust itself is illegal. The entire situation calls for thorough investigation. Already on June 22nd, the Andhra Pradesh government, led by Chief Minister Kiran Kumar Reddy, decided to withdraw 16 exemption the Trust previously enjoyed in conducting educational and charitable activities. This was the first move towards forcing the Sathya Sai Central Trust towards transparency. In future the trust has to file its income and expenditure report with the respective state government at least once in three years, according to section 154 of the Hindu Temples and Trusts Act (1987). Similarly, exemption given under section 59 of the Act had allowed the trust to skip the need to file information about the assets and properties of different trusts. Exemptions given under sections 58, 60, 61 and 65 of the Act had allowed the trust to do away with the yearly audit by the government, supervision by deputy collector rank officer, and submission of annual profit and loss account. It also lost the power to sell its land, property, intellectual property, publications, music and film productions, without giving any information to the government or adhering to the need to pass through the supervisory system provided by the government. All these exemptions will now be withdrawn, sources said. At the same time, the Trust was for the time being not to be charged Value Added Tax, building charges, commercial tax, registration fees, customs and other import fees for medical equipment. Probably, not to have continued these concessions would have seriously damaged the running of the institutions run by the Trust and caused a backlash from the many persons who benefit from them. Such a change would be drastic when the fall-off of donations – especially from abroad – which is bound to follow the revelations about the Trust’s dealings and the actions of certain trustees. Not least among the concerns of many devotees is the continuing refusal of the Trust to make public all details of events during Sathya Sai Baba’s illness and death which had so many extremely suspect aspects. The Sathya Sai College is already claiming considerable financial difficulties. There are already public complaints (see scan on the right hand) that, according to the practices instituted by their current ‘Eternal Chairman’, the deceased Sathya Sai Baba, the Trust has not paid staff properly and sacked staff illegally. See the following article which studies this matter in depth. There certainly appears to be a sea change in the network of collusion between Sathya Sai Baba and government in that already the Trust is being required to pay its full electricity bills, backdated by 15 months. Eventually it may prove politically expedient to put the private Sai institutions on the same footing as other enterprises and remove the privileges once given to Sathya Sai Baba for his Trust by his many devotee ministers. 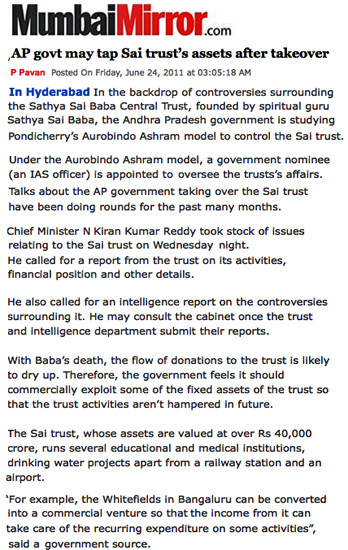 Sathya Sai Baba’s nephew Ratnakar’s bold statement that the Sai Trust was fully transparent is refuted by the very fact that the Trust has been issued an ultimatum to make their assets public inside 7th July, 2011, by the Andhra Pradesh government. This has not yet happened! The facts may have been fully transparent to him and the coterie of trustees, but not to the public in ANY way! Will the Trust make transparent its involvement in the rigid confinement and many suspicious circumstances surrounding the death of Sathya Sai Baba? We think not! Devotees cannot find out, not even his close family, not unless decisive pressure is brought to bear on the Trust by the proper authorities. The funeral celebrations were so large with so many VVIP visitors that the questions about Sai Baba’s last days were covered over, and the prestige of the politicians, the stars of spirituality, screen, stage or sport would probably come under a cloud if the facts were known. 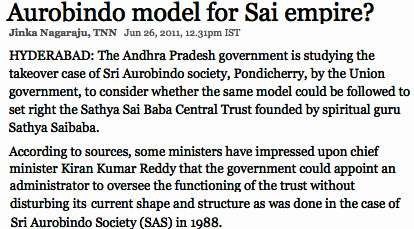 As to the Sai Trust, it remains to be seen whether the Andhra Pradesh authorities will have enough confidence and insight to institute a proper overview of the Trust’s dealings on the model of the Pondicherry Aurobindo ashram. The background of R.J. Ratnakar, the nephew of Sathya Sai Baba (and son of the infamous younger brother Janakiramiah), is hardly one that inspires the slightest confidence that this is a man of honest character, as can be seen on my previous blog Click me. Ratnakar was even trying to give the impression that he is stepping into the ‘spiritual sandals’ of Sai Baba! Sri Aurobindo Society as a model: Prashanthi Nilayam is going through a situation similar to the one that prevailed at the ashram of former Sri Aurobindo in 1973. After the death of his successor the ‘Mother’ – Madame M Alfasse – the the former smooth running of the Auroville (the international cultural and ‘spiritual’ township project) was upset by a number of complaints about misuse of funds and mismanagement by the Sri Aurobindo Society. So the Government of India set up a committee under the chairmanship of the Governor of Pondicherry with representatives of the Government of Tamil Nadu and of the Union ministry of home affairs to look into the matter. This procedure is likely to be followed in the case of the Sathya Sai Trust and its institutions. Sai Baba’s stored caches shake devotees’ faith: Police suspect that huge amounts of cash, gold, silver and precious stones could still be concealed in Yajur Mandir. The personal chamber of the spiritual leader, who passed away April 24, is believed to have false ceilings, false floors and rooms concealed behind almirahs (i.e. wardrobes). Reportedly, nobody except Sathya Sai Baba’s personal caregiver Satyajit had access to Yajur Mandir, especially the first floor where Baba used to live (however, only after he was hospitalized). It is well known that he had other visits there through the years since he moved in. There have been hundreds of Sathya Sai Baba devotees – not least traders in Puttaparthi – protesting, marching, holding placards and shouting slogans against the Sathya Sai Central Trust. BREAKING NEWS: The government of Andhra Pradesh – no longer under the heel of Sathya Sai Baba and his minions – has taken the previously unthinkable step of most likely withdrawing many of the extraordinarily wide-ranging exemptions from public scrutiny from the Sathya Sai Central Trust which it has enjoyed since the mid-70s, later also formally granted to the trust under the Hindu Temples and Trusts Act, 1987. These included “…exemption given under section 59 of the Act allowed the trust to evade information about the assets and property of different trusts. Exemptions given under sections 58, 60, 61 and 65 of the Act allowed the trust not to entertain yearly audit by the government, supervision by deputy collector rank officer, submission of annual profit and loss account.” All of the sixteen unusual privileges concerning auditing, some taxation, freedom from publishing accounts, non-supervision by government officials and others have now been revoked. Even the sale of assets by the Sai Trust is reportedly to be forbidden without government approval – including the right “…to sell its land, property, intellectual property, publications, music and film productions without giving any information to the government or pass through the supervisory system provided by the government. All these exemptions will now be withdrawn, the sources said.” “…chief minister Kiran Kumar gave the green signal to withdraw these concessions. “The exercise is meant to bring about more transparency while not restricting the various activities of the trust including the running of hospitals, university and other missions,” said a senior official dealing with the matter.” from Times of India – http://timesofindia.indiatimes.com/india/Finally-govt-to-rein-in-Sai-Trust/articleshow/8971689.cms). A serious investigation is underway and the Sai Trust will first be called to account for the irregularities so widely reported. The Chief Minister Kiran Kumar Reddy (not a Sai Baba devotee) rejected apprehensions by his cabinet that Sai Baba devotees may be offended by any governmental takeover of the Sai Trust. This seems to point to just such a decision being contemplated by the government. The golden era of secrecy, unaccountability, cover-up of embezzlement and money laundering in the Sathya Sai Central Trust appears to be coming to an end, despite the very strong political connections and protections the Trustees could rely upon while Sathya Sai Baba was alive. Sathya Sai Baba ‘Himself’ to blame: By his immense hoarding of property in secrecy in his strictly guarded $10 million palace, Sai Baba himself created the conditions for the loss of credibility of the Trust and his own self-proclaimed non-ownership of property (except his boys) and non-acceptance of gifts. The miserly style of the cache – much hidden under his vast bed, or behind false walls and in secret places under the floor and within wardrobes – including dried fruit, biscuits and a whole range of consumer products (besides the great amounts of gold, silver and currency like in Aladdin’s cave) – has shaken all those who believed his every word. Fortunately, the many devotees and office-bearers in his organization who left because they saw through the massive deceptions and break of trust that Sai Baba built his name upon have been variously pointing out the true facts for a number of years. Among their number there are many young men who describe most credibly how they were sexually molested – often severely abused – by Sathya Sai Baba. Corruption India: Sai Baba cult hoard plunder by Trustees? Now we see how the great miserly hoard the Trust denied existed, is being spirited away in vans and only the poor driver and minor go-betweens get caught. The Trustees are clever at cover-up and hand-outs as it has been a main part of their business since the bedroom executions in 1993 in which some trustees had a hand in blackmailing the police to carry out (notably Colonel Joga Rao, deceased)! The Supreme Court of India was instituted through P.N. Bhagwati – a life-long Sathya Sai Baba devotee and director of his charitable trust. This court destroyed its record of a petition made to it by Hari Sampath (former security guard at Sai Baba’s ashram) and presented by famous lawyer Kamini Jaiswal. The deletion of the official record meant that Embassies – especially the UK Embassy in Delhi – could not get confirmation that the petition had ever been made or a decision handed down. However, a copy of the court decision document evaded their attention – attested as genuine by a justarius publicus – and a scan of it is shown here The issue is treated here. The injudicious P.N. Bhagwati also signed the egregious letter against Sai critics along with the then Prime Minister, Vajpayee, despite the fact that no a single investigation of any kind had been undertaken by any of the signatories or any other official body in India, while the Supreme Court Petition was thrown out by judges who were Sai followers. The authorities even subverted the Right to Information Act to stop the Indian Skeptic’s Basava Premanand from obtaining any information on any investigation that may have been made… because none were (of course). The Sathya Sai Central Trust has managed to retain a certain reputation among devotees, its donors and most of the Indian press, despite revelations of embezzlement and more when the press descended on Prashanthi Nilayam after the murders and executions in Sai Baba’s rooms in June 1993. That trust has been rapidly eroded since the rigid confinement of Sathya Sai Baba – visits by devotees and family strictly prohibited – imposed by doctors and Trust members from the beginning of his illness until his highly suspicious death… evidently arranged to occur on Easter Sunday, as if this would convince any but the most deluded Christian Sai-devotees of any real connection between SB and Christ! The one revelatory incident after the other came in startling succession, eroding what credibility of the unaccountable and secret Trust – and certain of its trustees may have retained (most notably ex-Justice P.N. Bhagwati and the power-hungry nephew Ratnakara). On top of this dogfight – somewhat reminiscent of nights at Prashanthi Nilayam – comes the revelation in an Indian newspaper which ex-devotees have known for ages, but which has never previously been stated directly by any media outlet in India, that Sathya Sai Baba was for many years had in Bangalore a regular supplier of the trinkets – rings, pendants, bracelets and much else – that he pretended to ‘materialize’ in his interviews. These he often said contained diamonds, but not one has been found that was genuine despite numerous dissidents who took them to professional assayers. The journalist who wrote the Express report naively quoted the obvious lie that the pile-up in the mandir was due to Sai Baba not having met devotees for months. Anyone who knows anything about the true state of affairs is aware that Sai Baba never gave away anything of such considerable value to interviewees as genuine diamonds, gold or silver bullion or large sums of cash – he gave away a number of gold rings and a few small silver medallions and yet fewer small gold statues, but mainly cheap panchaloka (i.e. five-metal alloy) and enamel ornaments, watches (most often cheap ones) and even plastic earrings (a Norwegian lady recieved some and was not impressed!! In interviews, obviously, he never gave away from his huge store of dried fruits or biscuits, perfumes, Nike or Adidas shoes, plates, tumblers, hairspray or most of the other objects stored away under his bed and in cupboards and secret hidey holes. He may have provided such items for some of his chosen student boys… and as bribes here and there, but most of it was simply hoarded. How he could have become such a squirrel is hard to explain, unless as a symptom of senility (which was increasingly more evident in his behaviour and appearance through the last five years at least). 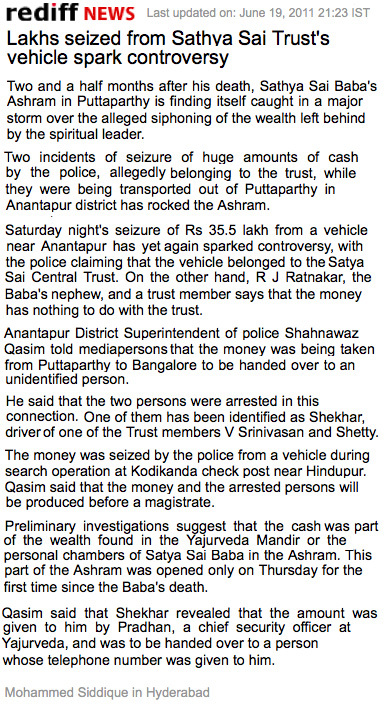 In the light of the extraordinary revelations at Puttaparthi of millions of dollars worth in currency and valuables, a fleeing Sathya Sai Central Trust van weighed down with millions in treasure beyond what has already been found, police arrests of the van occupants, and other such drama, I recommend Barry Pittard’s article, Sai Baba, Kubla Khan, Citizen Kane, Bill Gates et alia – as an entertaining, informative, read on the longer-term background. Typical of much of Pittard’s work, this article provides useful links for media and other researchers, as well as for those in the process of relinquishing their connection with the international Sathya Sai Organisation. There is a collection of photos of the extraordinarily lavish appointments at Sai Baba’s ashrams. A contact at an Andhra Pradesh police department has reported that a Sathya Sai central trust van fleeing from Puttaparthi has been intercepted. Three men caught with several crores of rupees of cash and valuables arrested. Update when this can be confirmed or denied officially. See previous blog on the huge treasure trove hoarded in secret in his closely-guarded rooms by the self-proclaimed propertiless renunciate Sathya Sai Baba – a vast mass of valuables and even food – some hidden under his five-by-five meter bed (what was that for, one asks?). Couldn’t he have taken them with him? In view of the documented facts that the Central Trust persons involved have lied about the hoard they claimed never existed (accusing critics of all manner of smear campaign! ), certainly including disreputable ex Chief-Justice P. N. Bhagwati who seems to have master-minded the cover-ups and exclusion of relatives and others promised access to the yajur mandir… in view of all that, suspicion falls on the same individuals as to the attempt to steal away a massive portion of the valuables. Only an independent investigation could get anywhere near the bottom of this deep deception… but the politicians will probably want to deny the corruption and let everything go on as before. Wait and see! Never forget that the self-appointed total renunciate of all worldly goods and desires was exposed after his death as a miserly hoarder on a huge scale. The genuine valuable diamonds he had were never given to any of those who he claimed to ‘materialize’ diamond rings for. Unless perhaps for one or two top Indian elite figures (though no one has ever produced proof of a single genuine diamond from him! (i.e. a professional diamond assayer. But assayers have shown that his claimed ‘diamonds’ were virtually worthless zircon or synthetic gemstones – see here). Sathya Sai Baba with hands in prayer? The Mumbai Mirror also reported:- “The Central Sathya Sai Trust, which conducted an inventory of the things stored inside the Yajur Mandir since it was broken open on Wednesday, came out with the announcement listing details of the treasure trove. The assessment was done in the presence of retired judge of Supreme Court A P Mishra and retired judge of Karnataka High Court Vaidyanatha. The room had two huge idols of Ganesh and Krishna, which Baba used to pray to for two hours every day. According to reports, diamonds presented by Saudi royalty were also found there. As many as 20 SBI staff counted the cash for 36 hours using three cash counting machines, apart from manually weighing the ornaments. Sai Baba’s official residence “Yajur mandiram” – built at a cost of around Rs 35-40 crores ( $9-10 millions) in 2006 – was opened yesterday by (only some of the) Sathya Sai Central Trust members. It had been kept locked for the past 2 months since Sathya Sai Baba’s final hospitalization (that is, apart from one entry by police to try to find the will of Sai Baba that someone had dreamed he told them it was in a silver casket there (Most amusingly, nothing was found!) . At 10 AM on 16th June, 2011, the key was brought from the State Bank of India – where it has been held – by the bank manager and the residence was opened. Sources tell me – as largely confirmed by some newspaper reports too – that a staggering amount of hard cash was discovered, in several currencies. It was so much that, after two hours, bank officials decided to bring in many currency counting machines. About 15 to 20 students were pressed into service to count the cash alone, and it took them many hours to complete the job. Unofficial reports say that the cash alone would be in the range of several millions of dollars. Satyajit was specially brought in by the SSB trust to identify all the places where the “divine treasure” has been stashed away, as he was the only one Sai Baba had trusted in his last few years. 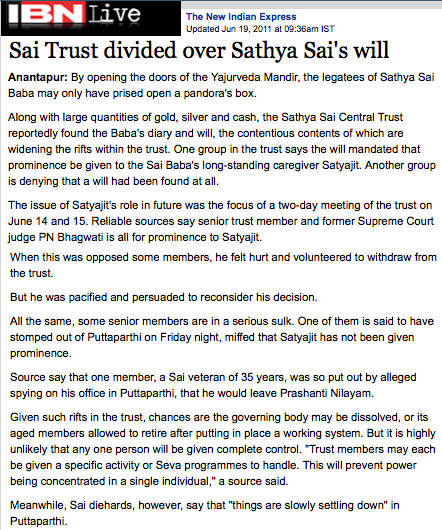 (NOTE: IBN Live reported 15 June:- “It is learnt that Ratnakar wanted the Trust to give no importance to Satyajit under any circumstances.” Meanwhile, the Hindustan Times, June 16, reported:- “Sathya Sai Baba’s personal care-giver Satyajit, who alone had the knowledge of the biometric lock system, accompanied the trust members and officials. During the spiritual guru’s lifetime, Satyajit was the only person who had access to his personal chamber.” So the Trustees had to swallow their pride or else remain locked out, but Satyajit complied even though everyone knonw Sathya Sai Baba intended him to be the one who would lead the Central Trust. Which strongly indicates how thoroughly dishonourable the remaining trustee power-brokers are. See more on their despicable lies below. 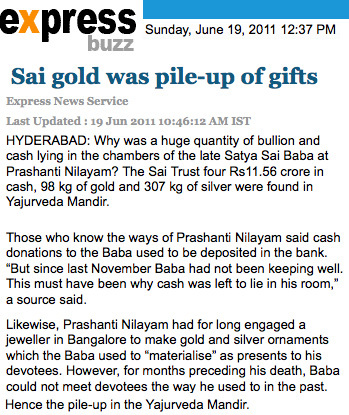 Rediff News, June 17, reports under the heading:- “Rs 11.5 cr cash, 98 kg gold found in Sai Baba’s room“. Enough said here! Apart from the huge cash haul, a large amount of gold, diamonds and precious jewelry has been found. Chains, lockets, rings etc in their hundreds were heaped in secret hiding places. Local sources say that this would only be a fraction of what had been originally inside Sai Baba’s residence as after his hospitalisation, several trucks of cash and gold had been reportedly spirited away by SSB trust members/their agents.A few computers were also found inside the residence complex, and are reported to contain details of Sai Baba’s huge financial empire. SSB trust members say they have videographed the inspection proceedings and would submit an inventory to the government soon, but they refused to comment or take questions, while Ratnakar, SSB’s nephew has said a statement would be issued within 24 hours. “18. In light of the baseless, irresponsible and false accusations of defalcation of gold, valuable artefacts and even money, it is emphatically stated that these accusations are wholly untrue and it is believed that these have been engineered by certain vested interests with a view to defame the fair name of the Trust, its functionaries and the Trustees. There is no truth whatsoever in these allegations. Indeed, almost everything their infallible preceptor, Sathya Sai Baba himself, said about money, property, selfless service, celibacy, proper behaviour, human nature and so on is contradicted by something else he said or did. Yet most of the top Indian elite still worships his memory and condones the Central Trust’s secrecy and undoubted corruption and suspected vast money-laundering without a single check or intervention! All these corrupt politicians attended the funeral of one of the worst guru exploiters of people in Indian history, Sathya Sai Baba, the Midas of Puttaparthi whose deceptions all turned to donated ‘gold’ for him and who died under such ignominious and suspicious circumstances without a death certificate or post-mortem while his Central Trust fought daily over the power and money at stake! It shows what a gigantic leap forward is needed for Indian politics and law ever to catch up with a moderately run and informed democracy, alas for the majority of its people! The great problem for Manmohan Singh and all the top politicians in India is that, in appearing to try to crack down on corruption, they cannot crack down on the leading figures who allow and/or turn a blind eye to it (i.e. themselves!) except where it is impossible for them not to act at least partially, as in the case of the huge Commonwealth Games international scandal. The government is beset by a populace claiming a clean-up, first led by Gandhi activist Anna Hazare (and of course, NOT by Sathya Sai Baba). In the case of the TV yogi guru Ramdev’s massively supported fast and demonstrations against top-level corruption, the huge demonstrations have been brutally suppressed with the support of the Indian Government. He said he would continue his hunger strike and organise nationwide protests this week against the police action. ‘It’s a blot on democracy and a conspiracy to kill me,’ he said. He accused Prime Minister Manmohan Singh’s government of reneging on a promise to take swift action against Indians who have stashed millions of dollars illegally in safe havens abroad. Latest News: As earlier reported, ex-Minister of the Telugu Desam Party, Nagireddy, challenged the secretive and unaccountable Sathya Sai Central Trust to release all details of the illness and death of Sathya Sai Baba. (The original Telugu text was posted at http://thatstelugu.oneindia.in/grapevine/2011/nagi-reddy-accuses-sri-sathya-sai-trust-210511-aid0070.html – a translation is found here). He has continued in the face of their silence, as the Times of India reports (see inset scan). Now the Trust promises details by June 16th. One must ask, why so long? One suspects that the Trust members are conniving on how best to conceal their role, avoid transparency and present a unified front against all those who want openness and accountability. A former student and non-follower of Sai Baba at the Sathya Sai College has kindly translated the Telugu news item I mentioned yesterday. G. Nagi Reddy of the Telugu Desam Party was a Minister for Andhra Pradesh, elected in1985 and lastly in 1989. 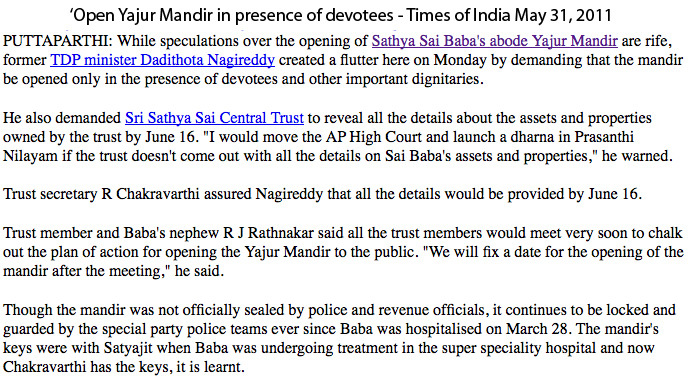 Former minister G Nagi Reddy alleged that trust members are responsible for the death of Puttaparthi Sai Baba. By subjecting him to mental torture, the trust members caused his death he alleged. He said it is the responsibility of trust members to dispel the doubts surrounding Sai Baba’s death. He claimed to have been informed by a few trust members that around the time he was being transferred to the super specialty hospital on March 28th, a tearful Baba had begged devotees to save him. There is all reason for this allegation, as anyone who followed the news reports that were (and still are) found on this blog – as widely disseminated in the Indian press – will know to be substantial. One has to say that Sathya Sai Baba – whatever his earlier crimes – did not deserve the reported ill-treatment he received. It is horrible that any person should be denied what all are entitled to when seriously ill or dying. To take an example, the Central Trust was seriously discussing at one stage to bury Sathya Sai Baba alive! Yes, all foreigners – and surely the great majority of Indians too – would be appalled at this, whether it has ever had any precedent in Indian convoluted and mythologized ‘spiritual’ history or not. What they eventually decided is in the greatest doubt as they practice the silence of the grave about all that happened during SB’s confinement, loss of organ functions, loss of consciousness and loss of life. The unaccountable totally non-transparent Trust is surely among the most untrustworthy institutions in India, and that is saying a very great deal!